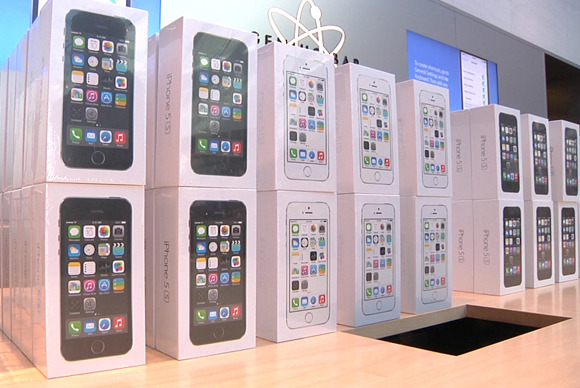 Speculation about poor iPhone sales appears to have been just that—speculation. Apple on Monday announced the figures for the first weekend of sales for its latest smartphones: The company racked up 9 million in the three days after launch, which Apple says is a new record. That 9 million includes sales of both the iPhone 5c and iPhone 5s; as is its wont, Apple doesn’t break out sales of individual models within its product lines. However, customers looking for an iPhone 5s may be out of luck for the moment: Tim Cook said that the company had sold out of its initial stock for the high-end smartphone, which was not available for pre-order, though the iPhone 5c was. But, if anything, twice the number of iPhone models has helped Apple rack up nearly twice as many sales: Last year, the company reported just 5 million sales of the iPhone 5 on its opening weekend; two years ago, the iPhone 4s brought in just 4 million sales. Apple also gave some figures on iOS 7 adoption: 200 million iOS devices have already been updated to the latest version of the mobile operating system. Earlier this month, Tim Cook said that Apple would ship the 700 millionth iOS device in October, so almost 30 percent of iOS devices out there are already running iOS 7. That number compares favorably with last year, when 100 million users upgraded to iOS 6 in the first weekend; in 2011, just 25 million users made the switch to iOS 5. Finally, the company also dished a little on the new iTunes Radio feature of iOS 7, saying that 11 million unique listeners had tuned into the streaming service; the most listened to song is “Hold On, We’re Going Home” by Drake. So, there’s that. While much has been made of Apple’s so-called “lack of innovation,” it’s clear that customers are pretty happy with the latest improvements to Apple’s smartphones. The company announces its financial results for the current quarter in about a month; we’ll see then just how well the iPhone is doing.